Study design: Elderly women received 100 000 or 200 000 IU of vitamin D3 or placebo orally every 3 months plus 1 g of calcium daily over one year to test intermittent dosing for improving the adherence of vitamin D therapy, targeting a 25OHD level of 75 nmol/l after baseline. 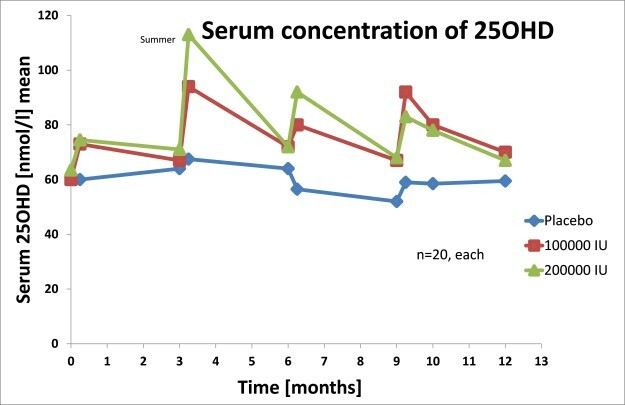 Results: Serum 25OHD levels increased but in both treated groups only with marginal difference. Approximately half of all measurements of 25OHD in both groups reached the goal of 75 nmol/l. Conclusions: Both applied dosis regimens are not able to keep 25OHD levels over 75 nmol/l over 1 year. Therefore, shorter dosing intervals between vitamin D3 administrations must be chosen instead of longer ones.